Is Product Variation Tripping Up Your Operations Team? Enterprises can harness the power of complex product variants with a robust CPQ solution. Via CPQ, manufacturers can manage product variance to effectively tame the knowledge and documentation challenges. The complexity of these challenges increases almost exponentially with the proliferation of large product families that address diverse markets and multiple applications. Product variability provides increased market opportunities for manufacturers by expanding the applicability of their product in the marketplace. This is accomplished through variability in design specs along with part and option selections associated with the base product. CPQ-managed product variability makes this process easier to execute and assures the manufacturer that product variants offered are appropriate, legal and aligned with the needs of the customer and intent of the manufacturer. How Does Product Variability Work? A ready example of how product variability works is found in the automotive world. For years, automobile manufacturers have utilized common platforms across several product divisions. Each division would address a different market segment offering a variant of the base product equipped with assorted options and design features desirable to the individual segment. Sales teams must be able to ask the right questions, understand the pains unique to the individual market and converse confidently with those who live and work in each individual market. Chrysler used this concept to launch its rebirth in the ‘80s with the K-car. The K platform product family was the basis for the Dodge Aries, Plymouth Reliant and Chrysler LeBaron automobiles. This strategy has been widely credited with turning Chrysler around and saving the company from extinction. It is not a difficult concept; a common platform defines a product family with variable design and option selections that define the individual products produced for sale. Variability in luxury levels, economy and performance can be selected to turn out a model that is economically priced and built around the economy car market. The same vehicle can be badged with an aggressive sounding brand, equipped with a high-performance engine, suspension and gearbox that would qualify it for the track. Yet another variant is upholstered in leather and appointed with bird’s eye walnut dash panels to attract the luxury market. In aerospace, companies like Boeing and Airbus have been exploiting this concept for many years. The Boeing 737 is the bestselling commercial airplane in history. It was introduced in the late ‘60s, and a variant of the 737 is now at the forefront of Boeing’s narrow-body offerings. Variant management is challenging. One famous carmaker got into some hot water with its customer base when some owners of its premium-branded luxury car noticed engines badged with a down-market division label under the hoods of its top-of-the-line rides. The example illustrates the difficulty of effectively managing the variability for complex products. The conundrum is the desirability of customized, personalized product with the simultaneous requirement of achieving the economies of scale associated with mass-produced products. It doesn’t matter if the products involved are specialty vehicles, power generators, chainsaws, cameras or electronic devices; the same basic product can be made attractive for the consumer, prosumer and professional users. Adding variants adds complexity. As the markets served become wider and more diverse, the knowledge required to operate within each of the subsets within the market increases. Specialized knowledge is required to address the individual market in the form of design knowledge, usage knowledge and tribal knowledge. Sales teams must be able to ask the right questions, understand the pains unique to the individual market and converse confidently with those who live and work in each individual market. This growth in knowledge required is also reflected in the documentation required to operate effectively in each market arena. Product management, engineering, sales, support and manufacturing operations all require access to and understanding of the technical issues, usage limitations, design requirements and other factors that affect the adaptation of a product to a given market. Effective variant management is needed to ensure that product configuration and price quoting are accurately and correctly executed. Configuration pricing will likely vary a great deal for various delivered models, and the bulk of factors driving the final price quoted may far exceed the price of the basic unit within the product family. Additionally, the complexity extends well beyond the manufacture and sale of product. Effective configuration management is needed to mitigate the challenge of managing variance across the product lifecycle. CPQ provides an invaluable medium for gathering and federating all of that knowledge. 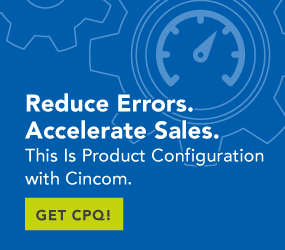 Further, CPQ is uniquely suited to using that knowledge and applying it to the configuration and pricing processes employed during the sales cycle. CPQ works directly with the sales team or prospect in an interactive interviewing process. This interview carefully examines the customer’s requirements and needs in light of their environment and other limitations that help to define the nature of the market served. This means, for example, that the customer will not inadvertently select a lower-cost, freshwater hull for a boat destined for use in a saltwater ocean or that a highway-rated heavy truck tire won’t find its way onto a piece of earth-moving equipment. CPQ can literally empower a sales rep to address multiple diverse and complex markets that may have once required a lifetime of experience to understand on the individual level. Product-variance difficulties are overcome by using the interactive interview to work through the maze of options, features and add-ons to configure and price the exact variation required. Complexity is a fact of life; it will never be eliminated entirely. But, complexity can be harnessed to increase the competitiveness of a product line or effectively increase the market and useful range of a product.